The Insurance Institute for Highway Safety on Thursday announced the aluminum crew cab 2015 Ford F-150 had earned a Top Safety Pick rating, indicating it’s safer in a crash than the 2014 steel version. However, while you might be better protected by the 2015 F-150 — and that’s not a small consideration — you might have to pay more to fix the truck afterward. The IIHS concluded that the F-150 crew both had “more extensive damage” and higher repair prices in both 10 mph front and rear collisions with a steel 2014 F-150, it announced in a Status Report posted Thursday. The IIHS crashed the driver’s side front corner of the 2015 F-150 into the rear passenger’s side corner of the 2014 F-150 at a 15 percent overlap, and then did the same test with the 2014 banging into the 2015’s rear passenger-side test. “In both scenarios, the aluminum F-150 had more extensive damage than the steel model,” the IIHS wrote. The two were fixed at a dealership certified to fix the aluminum F-150, and the bill came out to $4,147 for the front damage on the aluminum F-150, compared to $3,759 for the steel model. It comes up to a difference of $388, or 22 percent higher. Though the rear of the aluminum truck doesn’t look nearly as bad as the front in the photos provided by the IIHS, it actually cost more than $1,000 to fix than the steel version: $4,738 versus $3,275, or 42 percent higher. If you somehow managed to bang up both parts of the truck at the same time, the repair costs combined come out to be 26 percent higher, according to the IIHS. “From a simple bolt-on parts replacement to a more-involved removal and installation of entire body panels, fixing the aluminum F-150 is more expensive than repairing a steel-body F-150,” IIHS chief research officer David Zuby said in a statement. We do not agree with the repairability costs and findings by IIHS. Real-world repair costs for the 2015 F-150 to date are comparable to or less than other full-size pickups and an average $869 more affordable to repair than last year’s F-150 – not the higher numbers released after crash stunts orchestrated by IIHS and others. These costs are being tracked by Assured Performance, an independent body shop certification company that works with leading automakers. Insurance companies agree with the new F-150’s repair costs – with both Allstate and State Farm saying insurance costs for the new F-150 will remain comparable with 2014 models. Consumer Reports analysis also shows that the aluminum parts on the F-150 cost about the same as steel parts on last year’s truck and because the new F-150 is designed to make replacing components easier, in many cases labor charges may be lower. On the front of the aluminum truck, mechanics had to assemble components like wiring harnesses and splash guards under the totaled fender before installing a new one. The rear passenger’s-side impact resulted in having to replace one side of the 2015 F-150’s truck bed — something repairable on the 2014 steel F-150. Tail lamps, bumpers and exhaust pipes had to be swapped out on both model years. IIHS communications Senior Vice President Russ Rader said the shop charged the same labor rate for aluminum and steel; some collision repairers see higher aluminum labor rates as a way to recoup the costs of the training and equipment necessary to properly fix the mainstream truck. Rader also said there were no component differences between the two trucks aside from the assembly of the wiring harness on the 2015 F-150, making it a true apples-to-apples comparison. “There were no parts damaged like rear cameras or anything like that,” Rader said. More advanced features such as rear-view cameras or forward collision prevention sensors have been seen by experts as likely to raise repair costs. 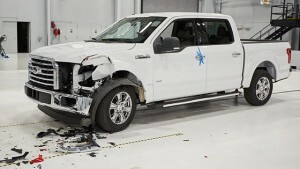 Edmunds demonstrated that when it notoriously banged a sledgehammer into a 2015 F-150 and damaged the rear tail light. Associate editor Travis Langness wrote that their F-150 had the Lariat Trim package, which meant that rear tailight assembly contained a backup sensor and resulted in a pricier repair. The light had to be replaced as a single unit after the sledghammer attack. “The price jumped from $106.28 to $887.25. For a taillight,” Langness wrote.